I got too busy with work, lots things happened that I should post it here. Let me start with a small one. During Oracle 11g DB (standard version) install, I run into an error, "Error in starting the service. The service OracleMTSRecoveryService was not found". I ignored it a few times. Then I decided to take a closer look and found a work around. here is my solution. When this error box pops up, keep it there. Fire up regedit go to "computer\hkey_local_machine\system\controlset001\service\OracleMTSRecoveryService". Double click on ImagePath, then change the path to where your Oracle is actually installed. then click on "retry". that solved my problem. You may need to look around to see where your DB is actually installed. By defatul, it is installed under "c:\app\yourAcctName". it not working for me. error that am getting is "Incorrect Function"
Another point: check the values in \HKEY_LOCAL_MACHINE\SOFTWARE\Oracle\OracleMTSRecoveryService node. Pay special attention at the Host key in ..\Protid_0 sub-node. And look at the paths in other keys of this sub-tree. Thank you Oleg and Yuan! I needed to edit both registry keys in order to fix my issue. 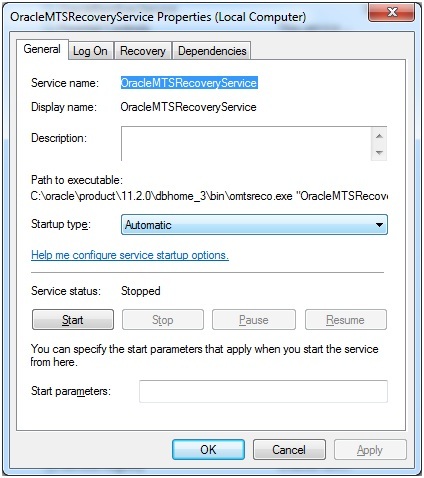 Hi, pls apart from C:\app\myaccount\product\11.2.0\dbhome_1\bin\omtsreco.exe "OracleMTSRecoveryService"
where else did u edit? Thanks a lot!! !Yuan...you solved my problem..you have described it so simply..thankyou very much!!! This was perfect, resolved my issue..thanks! yeah.. I agree Komal, this should be a part of installation itself. Amigo muchas gracias!! te mandaste! me habia hecho pedazos este software! Abrazos amigo! You, sir, are a star! Perfect. Thanks so much for the post, it solved the problem for me. Thank you...worked like a charm. Great help!!!!. You are the man!!!! Great! Thanks for the assist! Спасибо из России Вы умный человек!! This did not work for me. The path in the registry is already pointing to the correct install directory. I do not have any sub nodes in the registry either. I still get this error when installing 11gR2. Any othe fix out there? Another question is that should i remove ODBC too from registry?? Same here. I deleted the ODBC folders from the registry though. thank you so much! this fixed my problem. thanks for posting! Thanks!! Still working in 2016 and Win 2k8. For those who think path is right, compare each character of current path and the path in the registry. 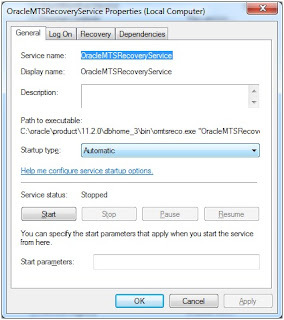 Please help me out this error ,,wen im installing oracle 11g i'm not able to completely installed its throws error as "Error in starting service.The service OracleMTSRecoveryService does not exit"
It shows the error 'the oracleMTSRecoveryService does not exists' please help me in solving this problem. In the event that you are attempted to startup the Oracle database and got some specialized blunders at that point don't stress, simply attempt these beneath ventures to take care of your concern. To begin with you need to check every one of the organizers in the way as of now exist and furthermore check the consent on record way you are utilizing enable the database to peruse/keep in touch with it. All things considered, if as yet standing up to this issue at that point contact to Database Administration for Oracle or Online Oracle DB Support for fast and dependable help. Shockingly, this issue is mostly looked by a huge number of clients once a day yet absence of good master bolster they can't get right help with respect to Oracle. Yet, with Cognegic's Online Oracle DB Support and Database Administration for Oracle, you can without much of a stretch bring the best and fitting help. Our IT experts can catch thorough perspectives of general Oracle condition, by giving you world-class bolster. On the off chance that you have any issue or question at that point get in touch with us and investigate all issues.